How did NBA Team’s Fans React to their Team’s Playoff win or loss? How did the playoff team’s fans react to their team’s performances yesterday in the second day of the playoffs? The Houston Rockets, in falling to the Portland Trailblazers, also lost some engagement/storytellers (PTAT). Portland gained 12,000 more storytellers via their win. Washington came up with a surprising win against the Chicago Bulls, adding 2,500 engaged fans. 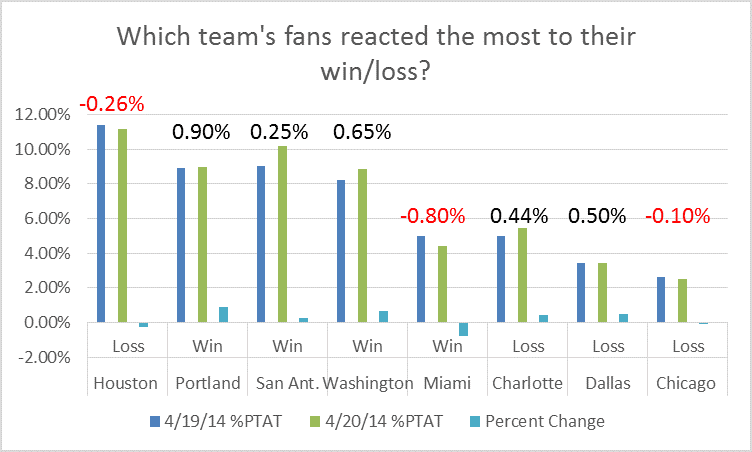 Charlotte and Dallas were the odd ones out ,as both teams actually increaed their PTAT% by 0.5% after losing. We’ve seen before that winning fans engage far more than losing. If you’re the head of digital at any of these teams, how much success can you attribute to the team’s on-court performance, the loyalty of your fans, or the efficacy of your marketing initiatives?